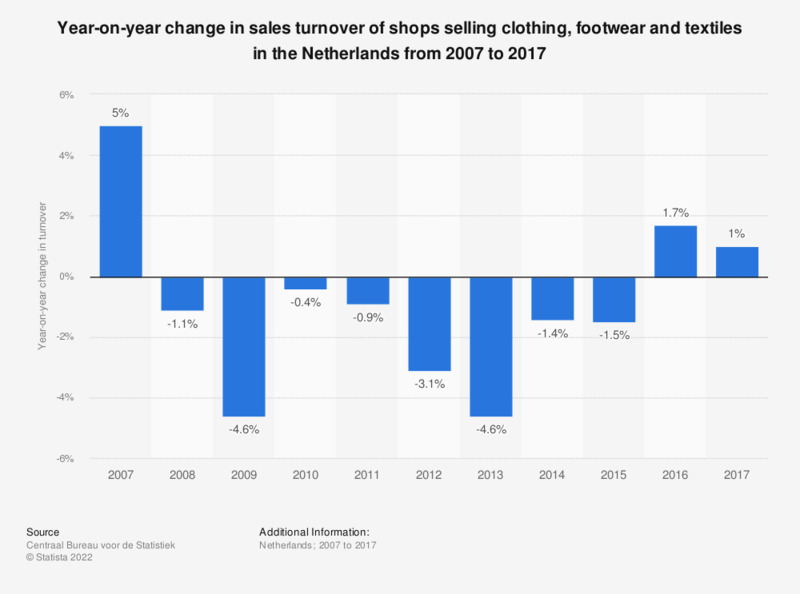 This statistic depicts the year-on-year percentage change in sales turnover of shops selling clothing, footwear and textiles in the Netherlands from 2007 to 2017. Turnover from Dutch clothing, footwear and textile store sales increased by one percent in 2017. Shops for clothes, footwear, textiles - "Shops selling clothes, shoes, fabrics, textiles. This category combines categories 4751 shops selling clothing fabrics, household textiles and haberdashery, 4771 shops selling clothes and clothing accessories; textile supermarkets, 4772 shops selling footwear and leather goods." (SIC 2008). Change in turnover: "Indicates the growth rate with respect to the same month of the previous year as a percentage. Statistics Netherlands calculates this on the basis of non-rounded figures." Turnover: "The value of sales of goods and services to third parties, VAT included. Turnover includes the main activity as well as secondary activities. Third parties are consumer and enterprises not belonging to (the Dutch part of) the own group of companies."